Everyone who enjoys a puzzle or two always have a few stacks laying around at home, whether it be puzzles we have never finished, or puzzles that we do not want to put together again. We’re here to give you a chance to pass those puzzles along, and give you value in return. We will not be taking any other items in prior to, or during, the day of the sale. Just like our previous used game sales, we will have you drop off your puzzles and include an asking price for each item. Then we will put them on the shelves for 2 days and see if they sell. If they do not sell, we will have you pick up your puzzles, and if any of them do, you will also be getting store credit in the form of a gift card with how much money you made. 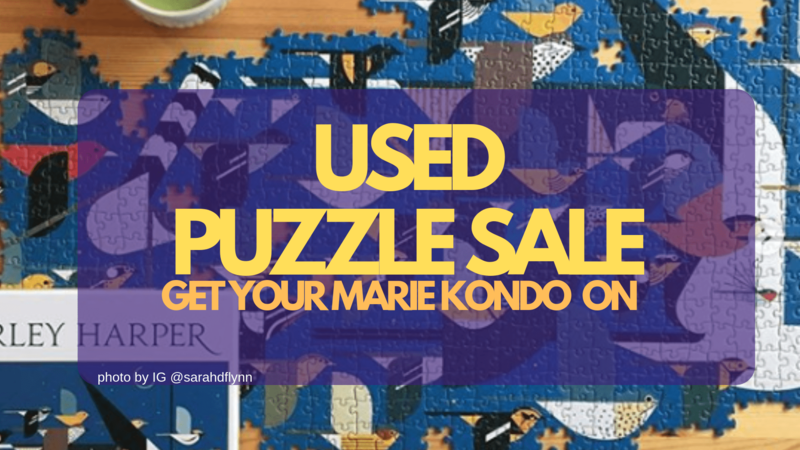 If you sell a puzzle for $5, you’ll get $5. If you sell one for $10, you’ll get $10. All items accepted for the sale must be in new/barely used condition. If jigsaw puzzles are missing a few pieces, say 5 missing pieces in a 1000 piece, that is okay, but please label it as such. Acceptable items for the sale include: Jigsaw Puzzles, crossword puzzles, 3D puzzles and Brainteasers, other forms of brainteasers, etc. If you have any questions please call the store, or contact us via our email. We will also do our best to respond to any questions posted in the comments below the event or if you contact the store.